The No. 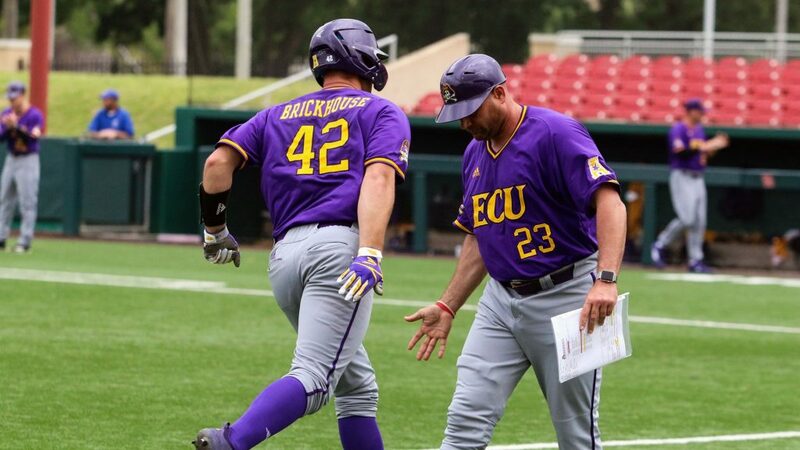 11 ranked ECU baseball team swept a Saturday doubleheader to take a series win over Houston this weekend. Here are five takeaways from the series. Doubleheader dominance: ECU has swept all three of its doubleheaders this season. Radford on a Friday, Monmouth on a Saturday and Houston on Saturday. The most important doubleheader of the season is coming up on Saturday as ECU plays in Los Angeles against the No. 1 ranked UCLA team. End of a streak, only barely: ECU’s 10-game winning streak coming into the Houston series came to an end with a 2-0 loss on Friday. ECU hadn’t lost since it’s 7-2 loss at Duke. ECU bounced back by winning the next two to possibly jump start a new winning streak, although the top-ranked Bruins will present a big challenge for that. All in all, ECU has won 16 out of 18. Airtight bullpen: The ECU bullpen continues to be a pleasant surprise and didn’t disappoint against the Cougars. The bullpen didn’t allow a single earned run all series, and just one unearned run against Gavin Williams in the 15-3 win, which didn’t matter anyway. Alec Burleson threw 2.1, Evan Voliva threw 1.1, Evan Odum threw 1.0, Williams threw 3.0, Ryder Giles threw 1.0, Cam Colmore 1.0 and Zach Barnes 0.1 innings, all without an earned run. Adaptability: This one is pretty easy to see but could go either way. ECU’s offense was shut out on Friday, the first time all season the Pirates hadn’t managed a single run across. They didn’t have a hit even until the fifth inning and got five all game. To say they bounced back would be an understatement after the 15-run output in the next game. Spencer Brickhouse had two home runs and six RBI, Jake Washer also drove a home run out. Then in the series finale, they managed three runs and only had two hits in the first six innings. Washer came through again with a home run to break the tie for the series win. Series are hard to win and all kinds of challenges pop up through the course of a series, so it’s good for the Pirates that they can pull out a series win in different ways. ECU still hasn’t lost a weekend series and is 21-3 in those games. Atop the American: ECU is now 8-1 in AAC play and firmly atop the standings after three conference series. ECU’s conference win percentage is 0.889 and the closest school to them is Tulane at 0.667. Right after Tulane is UConn, who comes to Greenville to play against ECU beginning Apr. 18.